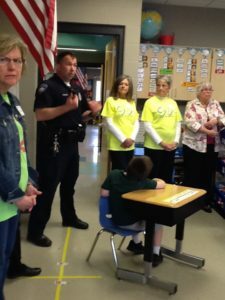 Waterloo – Quota International of Waterloo and the Evansdale Police Department promoted literacy and the love of learning with elementary students at Poyner in Evansdale on Tuesday, April 18. Members of Quota, a School Resource Officer (SRO) and a Waterloo School district literacy coach distributed a new book to each Poyner student. These age-appropriate books will become a part of the student’s home library. The officer also talked about the importance of reading. Kids were given an opportunity to ask questions of the officer, fostering positive relationships between law enforcement and youth. Since 2004, Quota International of Waterloo has distributed over 44,000 books to children in Waterloo Schools, representing $92,000 in donations to the project. Officially known as Cops ‘n Kids Literacy Program, Quota funds this project with a combination of annual fundraisers including the club’s nut sales and spring brunch. Over the years, generous support has been provided by local funders such as the Guernsey Charitable Foundation, R.J. McElroy Trust, Community Foundation of Northeast Iowa, Ronald McDonald House Charities and most recently, the Waterloo Community Foundation.